Great place. Spick snd span. Superb location. Excellent communication. A lovely building in the heart of Granada's historical centre. The Albaicín is just behind the hotel - the Alhambra is just in front of it. Great restaurants and bars are all around. The apartment itself is lovely - very comfortable, all the facilities you need, a nice living room, kitchen, spacious bathroom etc. The location is amazing, gorgeous views and right by all the best sites. The apartment is comfy and very nice. Fantastic flat looked almost brand new. Great amenities and the location was perfect. Excellent Location, super clean, helpful staff, very comfortable stay. We really enjoyed our stay, Staff have been very helpful to guide and answer our questions, Room were equipped with modern kitchen equipment's, Extra points to bed and linen. The location was excellent, right off of plaza nueva with an assortment of bars, restaurants, cafes, shops nearby. The room was clean and the staff were helpful and pleasant. The rooms were large and spacious and the location was excellent. Views out the terrace were lovely. 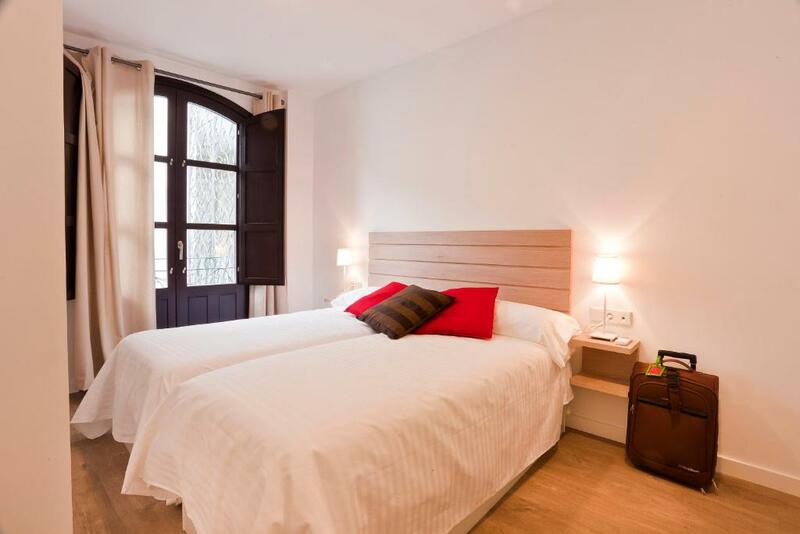 Lock in a great price for Casa Miravalle Apartamentos Darro – rated 9.2 by recent guests! 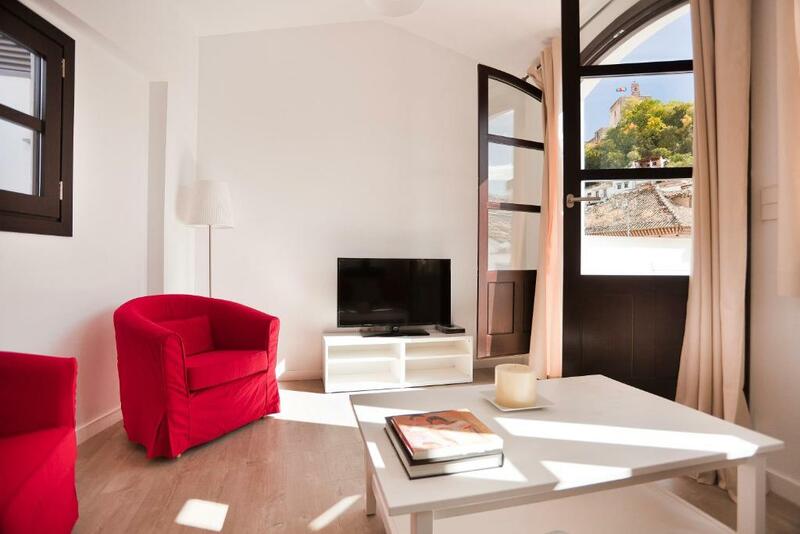 Set next to Granada’s Plaza Nueva Square, Casa Miravalle Apartamentos Darro is located 2 minutes’ walk from the charming Albayzín District. 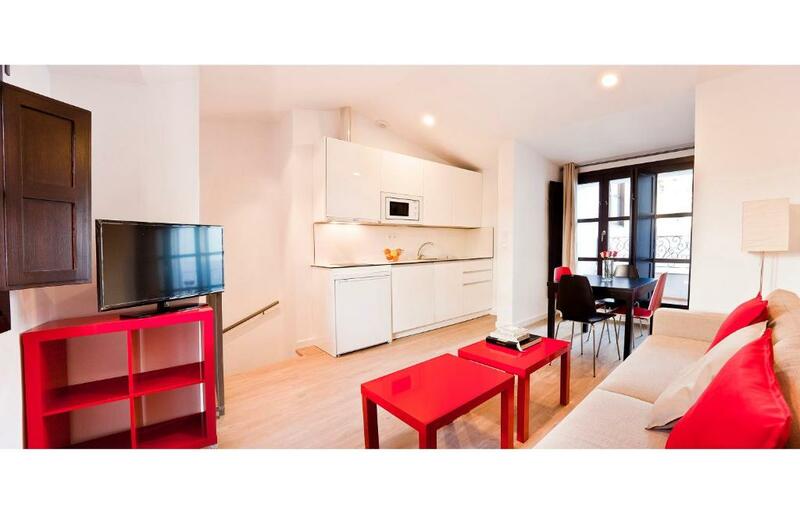 The modern apartments offer free Wi-Fi and air conditioning. The bright apartments have a living room with a sofa and flat-screen TV. A microwave and washing machine are included in the kitchenette. The bathroom comes with a shower and free toiletries. Some apartments feature a terrace or balcony. A large variety of bars and restaurants can be found in the area. 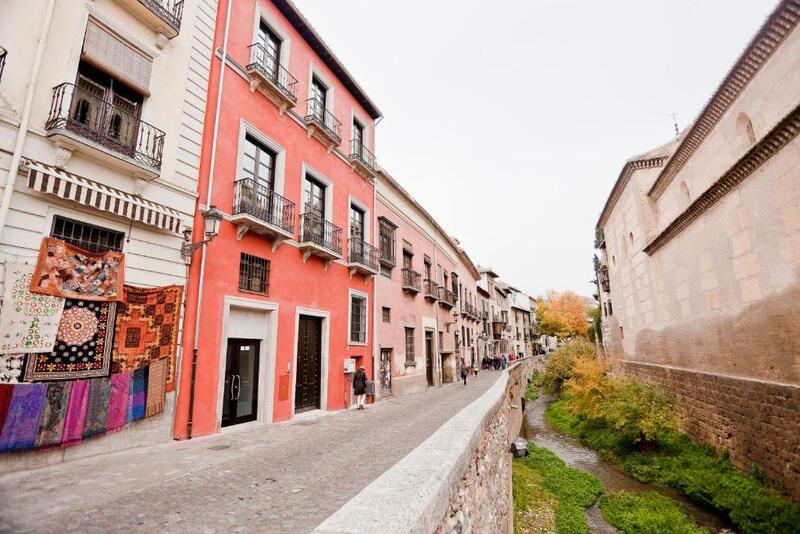 Granada’s popular shopping streets are 5 minutes’ walk from the property. 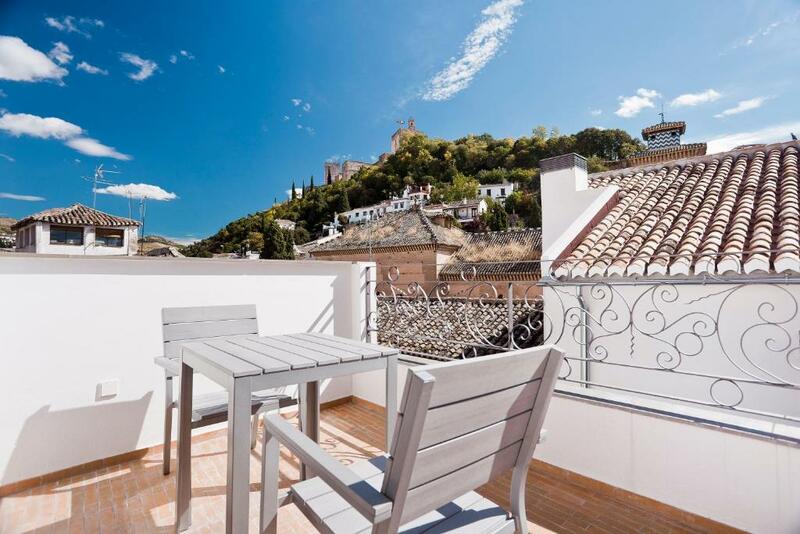 Casa Miravalle Apartamentos Darro is set on the beginning of the beautiful Carrera del Darro Street and 1,650 feet from Granada Cathedral. The Alhambra Palace can be visited in 10 minutes on foot. Within 2 minutes’ walk, guests can find a bus stop with connection to Granada Airport. When would you like to stay at Casa Miravalle Apartamentos Darro? Featuring a balcony with views, this apartment has a living room with a sofa and flat-screen TV. 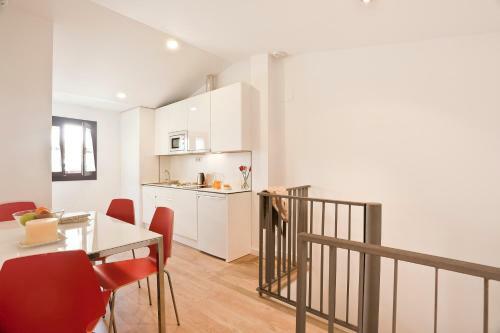 A microwave and washing machine are included in the kitchenette. The bathroom comes with a shower and free toiletries. This apartment has a living room with a sofa and flat-screen TV. A microwave and washing machine are included in the kitchenette. The bathroom comes with a shower and free toiletries. 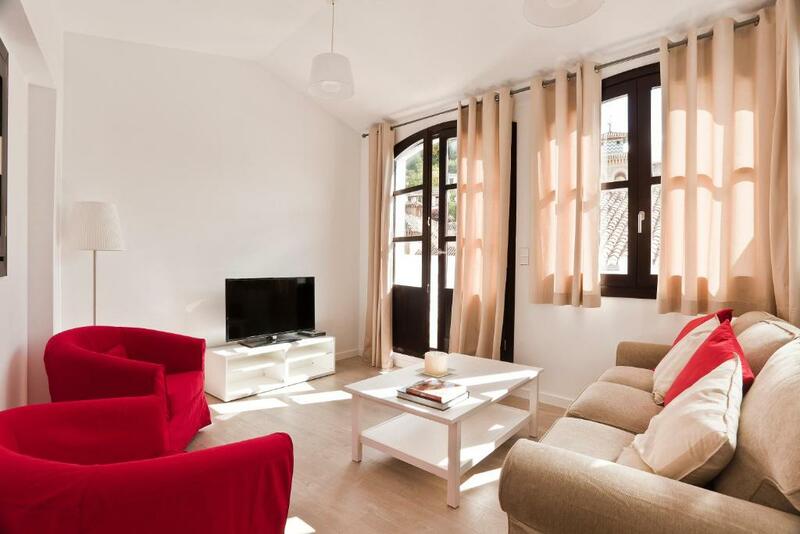 Accessed via the patio, this apartment has a living room with a sofa and flat-screen TV. A microwave and washing machine are included in the kitchenette. The bathroom comes with a shower and free toiletries. This apartment has a living room with a sofa and flat-screen TV. A microwave and washing machine are included in the kitchenette. The bathroom is adapted for guests with reduced mobility and comes with a shower and free toiletries. This air-conditioned studio features a flat-screen TV. It includes an electric kettle and a coffee machine. Please note that this studios does not have a kitchen or cooking area. This studio features views of the Santa Ana Church. The kitchen is equipped with a ceramic hob, fridge and a microwave. Please note that the studio is accessible through the property's patio. 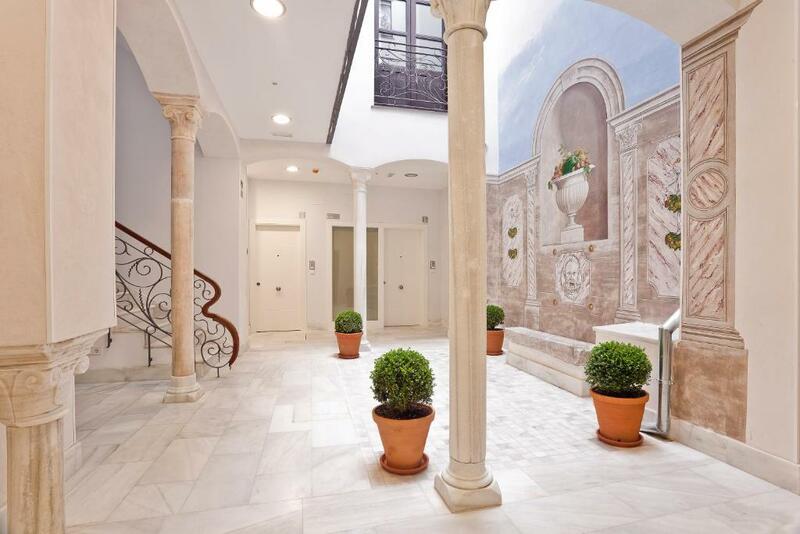 House Rules Casa Miravalle Apartamentos Darro takes special requests – add in the next step! Casa Miravalle Apartamentos Darro accepts these cards and reserves the right to temporarily hold an amount prior to arrival. Please inform Casa Miravalle Apartamentos Darro of your expected arrival time in advance. You can use the Special Requests box when booking, or contact the property directly using the contact details in your confirmation. The indoor staircase needs to be fixed, although it was not dangerous (just making noise). Great location. Spacious and clean room, from the terrace you can see Towers of Alhambra palace. Very close to historical area and a bus station where Alhambra buses depart. We must stay here again when visiting Granada. Maybe some more cookware but no biggie. First of all, we arrived there 1 hours before the check-in time and, although the apartment was ready, we weren't allowed to get in until one hours later because of... ? Also there are some weird rules like, you having to take the trash out of the apartment when you leave (although they don't tell you where you should leave it) and you can't cook certain food even though there is a fully equipped kitchen there. Lastly, the bathroom had a few annoying things like, the soap dispenser being right above the toilet paper, so the latter was often wet from your hands when getting soap. The shelf for you to put bathroom things (deodorant, tooth brush, etc) was above the toilet, so I was always scared something would fall right into the toilet. I loved the red warming light in bathroom for when we left the shower though! The apartment itself is nice, spacious, comfortable and well-located, but the service could improve. I stayed in a duplex apartment. A bit tricky if you are elderly or have young kids due to spiral staircase. The location was so perfect for all the tourist sightseeing. With washing machine and dryer rack so it’s convenient too if you stay for longer period . Everything is close by and while the taxi could not drop you right to the location, it is only about 100 meters away from taxi stand. The receptionist was also very helpful and helped to courier some items that i had accidentally left behind. Thanks a lot Cynthia! The balcony view is amazing. The room is clean and comfortable. Great location, view from the balcony, express check in, almost new apartament with all facilities like washing machine, microwave, nespresso machine, fridge, kichenette. Highly recomended, I will stay there again next time. Location was perfect infront of the river - you hear the water sound like you are in the heaven - near to Alhambra and Albaizin old town, near to Taxis - restaurants around the area. The flat was very clean and brand new, we were family with three kids and the flat was too big enough, price was great. The apartment was large and bright, the bed very comfortable. 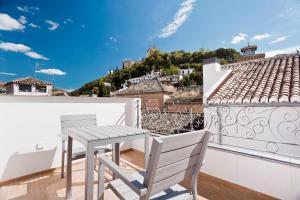 The best part was the location, opposite the church of Santa Ana and plaza Santa Ana in the heart of the old town. Everything was in walking distance and the Alhambra could be seen from the window. It is really nice that the management staff is right on site. She was super helpful. Good value for money: very clean, good location and close to the airport bus, staff are helpful. There are several good restaurants nearby.